This is my new cactus. It's a rare (or mezurashii) cactus, apparently. Because it has yellow flowers. His name (yes, it's a he) is Hans. He came from Kagawa. His seller is a lovely older German bloke, who speaks wonderful Japanese, and a smattering of English. Each year this gent comes around our schools to sell the plants he grows. I didn't buy any last year, because I had no cash on me at the time. But this year, I wanted to buy a plant because plants are good for the soul, and because this German is such a nice man. He said that soon he would return to Germany to see his 93 year old mother, because he wanted to look into her eyes. 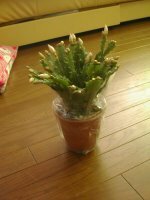 I also decided on a slightly more expensive cactus because to sell a plant to me is usually a death sentence for the plant, and I want this one to have a fighting chance. It only needs watered once a week. I think my sunflower from ren-cho lasted all of two days. I shally try harder, with Hans, my German cactus.